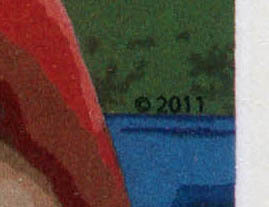 The hidden date for this stamp can be found along the right edge of the stamp. 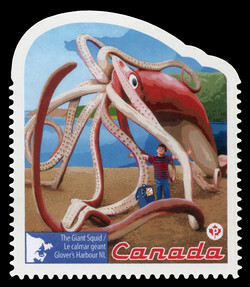 The roadside attractions booklet included an envelope seal that paired with this stamp. 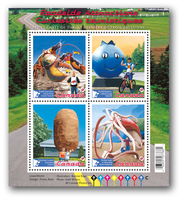 Nothing says summer like the freedom of a road trip—or the appearance of the Roadside Attractions stamp series from Canada Post. For this third journey, we’ve set our sights on the Eastern Provinces—and found quite an appetizing link between the roadside marvels of the East Coast. Shediac, New Brunswick, is known for its lobster—the mainstay of the town’s economy for many years. As a tribute to this delicious crustacean—and a means of getting their town some much deserved attention from tourists, the Shediac Rotary Club built “the world’s largest lobster,” which now attracts roughly half a million visitors a year. Designed by notable animal sculptor, the late Winston Bronnum, the lobster is made of reinforced concrete and steel. It took three years to build and was completed in 1990. Measuring 10.7 metres in length and 5 metres in height, it weighs 50 metric tons and rests on a 32 metric ton pedestal. Oxford, Nova Scotia, claims to be the Blueberry Capital of Canada. As a symbol of that status, Oxley, the giant Wild Blueberry has made his home at a gas station at the entrance of the town since 1999, when the Irving Oil Company “relocated” him from Peticodiac, New Brunswick. Standing 2.4 metres high and 3.3 metres wide, this big brute of a berry, built of steel rebar and cement, weighs in at eight tons. You say “potato,” they say “really big potato,” particularly if they’re from the community of O’Leary in the western part of Prince Edward Island. Located at The Prince Edward Island Potato Museum and surrounded by fertile potato growing fields, as well as plenty of tuber trivia, this giant potato sculpture guards the entrance to the museum. Made of fibreglass and standing 4.3 metres high and 2.1 metres in diameter, this spectacular spud has mashed its way into many a tourists’ snapshot. Big on calamari? They are in Glover’s Harbour, Newfoundland, where, in 1878, fishermen landed a giant 16.7 metres long squid, recognized by the Guinness Book of Records as the biggest creature of its kind in the world. This life-size sculpture, completed in 2001, was designed by Don Foulds, with collaboration from Edward O’Neill, Niel McLellan, and Jason Hussey. 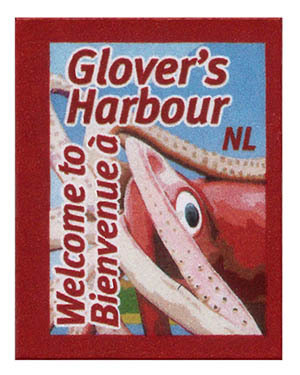 Located on the main drag in Glover’s Harbour, this concrete and metal replica is positioned close to the site of the original squid’s capture. In July 2009, Canada Post kicked off this cross-country issue with a journey west straight to the Rockies. Our first stop on the map was in Prince George, BC, where we pondered Mr. PG, a hard-to-miss 8-metres high mountain of a “log” man who has made Prince George his home since 1960. The next stop was a “sign” of great things to come. In Watson Lake, YK, one will find sign-post forest situated right in the middle of a majestic patch of untamed wilderness. In 1942, it seems, a homesick U.S. Army G.I. was working on the Alaska Highway. To ease his loneliness, he put up a sign pointing the way and showing the mileage to his hometown. Soon, others got the same idea and the Watson Lake Sign-Post Forest’s count today exceeds 64,000 signs. We then headed east to see the Hay River, NWT’s Inukshuk. Built in 1978, as a symbol for the Arctic Winter Games, this attraction was inspired by the age-old Inuit tradition of building stone giants to guide travelers through Canada’s vast landscape. We took the hint and went south along the Yellowhead Highway to Vegreville, AB, to set our sights on the world’s largest Easter egg, the very large and very colourful Pysanka, which symbolizes the town’s vibrant folk culture. In the summer of 2010, we continued east on the TransCanada Highway, stopping first in Davidson, SK, where visitors are greeted with a giant Coffee Pot. A tribute to the town’s hospitality, it’s believed that this 7.3 metre-tall landmark has the capacity to fill nearly 150,000 cups of coffee. Then we were off to visit the town mascot of Gladstone, Manitoba, the beloved Happy Rock, as he welcomes visitors to the town. In fact, Happy Rock was even happier this year, because in honour of his stamp, his citizens gave him a fresh paint makeover. We landed into Wawa, Ontario, which means “wild goose” in Ojibwe. There, the giant steel Wawa Goose stood ready for flight, reminding us that the town is a stopover for flocks of Canada Geese headed south for the winter. Still moving east, we were spellbound by the beauty of Quebec’s Côte-Nord region, when we came across a giant Atlantic Puffin in Longue-Pointe-de-Mingan. By then, it was time to rest up for the remainder of the trip, further east to the Atlantic provinces. Design: Fraser Ross. Illustration: Bonnie Ross. 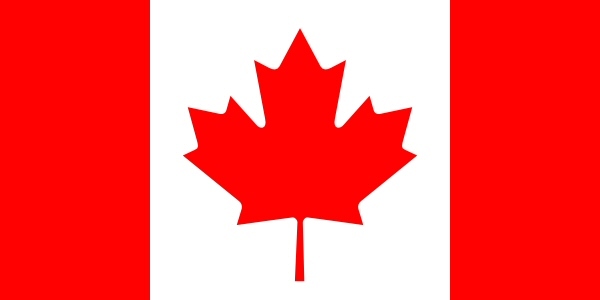 Photography: Dale Wilson, All Canada Photos Inc.